Our people are our most important asset and the key to our success. Embedded ConocoPhillips' core SPIRIT values is a strong commitment to building a legacy of trust and enhancing the quality of life in the communities in which we live and operate. 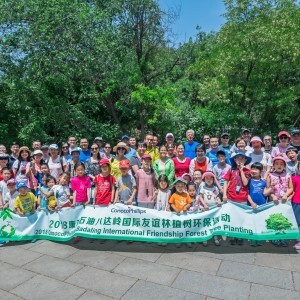 ConocoPhillips is fostering a volunteer spirit at the company through community-based activities that aim to would be able to address some important social issues in China. Sunshine Home is a non-profit foster home funded by Mr. Wang Baijun for mentally and physically disabled children in severe need. Sunshine Home is responsible for the nursing, recovery practicing and skill training for 38 children. In 2009, 2010 and 2011 ConocoPhillips Tanggu onshore and offshore staff held a charity auction to fund a craft workshop to help sustain the Sunshine Home. RMB 178,000 (US$27,800) was donated with company’s one on one matching fund. In 2010, ConocoPhillips China volunteers raised RMB 10,000 (US$1,500) for the Sunshine Home in a charity craft sale from the workshop. COPC staff visit the children at Sunshine Home regularly, bringing them food and basic necessities. In spring 2010, continuous drought in South China's Yunnan Province made life for local people extremely difficult, with water shortages severe enough to threaten the basic food supplies, especially in schools. In response, ConocoPhillips China employees in Beijing and Tanggu raised RMB 16,410 (US$2,400) through a company wide charity sale as well as used clothes and book donations to help the students at Wenquan School which is near to Lugu Lake. In March and November 2010, volunteers also went to Wenquan School to visit the students there and provided ConocoPhillips’ Jelly Jam environmental education training. In August 2011, just before the school autumn semester started, staff in Tanggu donated RMB 2,579 (US$400) and bought basic necessities for the Wenquan School. 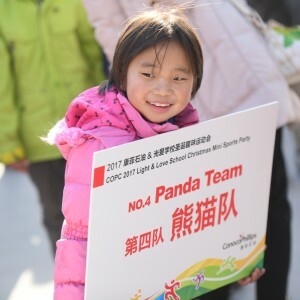 Between 2010 July and December 2013, 30 COPC volunteers in Beijing joined the one-on-one education aid project and accumulatively donated RMB 157,283 (US$25,000) to fund schooling for 20 students in poverty. The donation was made through Yongning Education Aid Center, a local grassroots non-profit organization.